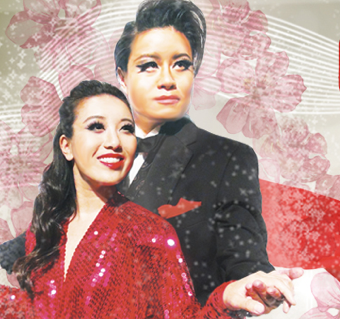 East West Players, the nation’s longest-running professional theater of color and the largest producing organization of Asian American artistic work, continues its 50th anniversary season, with “Takarazuka!! !” by Susan Soon He Stanton, directed by Leslie Ishii with choreography by Cindera Che, from Nov. 6 to Dec. 7, in community partnership with Japanese American Cultural and Community Center and AARP. Yuko is the top star of the Takarazuka, an all-female Japanese performance troupe that has put on lavishly staged spectacles for decades. Facing retirement, she begins to be haunted by the ghost of a former top star. Mysterious events happen at the theater as Yuko’s sayonara performance looms and a new star is set to rise to the top in this thrilling and seductive new play. The cast: Fiona Cheung, Joseph Lim Kim, Michael Hagiwara, Klarissa Mesee, Joy Regullano, Janelle Toyomi-Dote, Grace Yoo. Set design by Tesshi Nakagawa; costume design by June Suepunpuck; lighting design by Jason Bieber; original composition and sound design by Nathan Wang; titles design by Nicholas Drashner; prop master, Yee Eun Nam; stage manager, Maya Rodgers. Previews are Thursday, Nov. 6; Friday, Nov. 7; and Saturday, Nov. 8 (all at 8 p.m.), and Sunday, Nov. 9, at 2 p.m. All preview seats are $23. A ticket to opening night on Wednesday, Nov. 12, at 8 p.m. includes a 7 p.m. pre-performance cocktail reception and a post-show reception with the cast and creative team. Call EWP for ticket prices and availability. Pay-what-you-can performance on Wednesday, Nov. 26, at 8 p.m.
On Sunday, Nov. 23, a chat with the performers and creative team immediately follows the 2 p.m. show. A complimentary glass of red or white wine will be served before the Friday show during the regular performance run. Interested parties must be 21 years of age or older to drink. Regular tickets range from $28 to $38. Student and senior discounts are available. East West Players is located at Union Center for the Arts, 120 Judge John Aiso St. (between Temple and First streets) in Little Tokyo. For more information, call (213) 625-7000 or visit www.eastwestplayers.org. For this production, EWP is launching its first Indiegogo campaign. “We want the show to look fantastic, and we want you to enjoy it,” said an EWP spokesperson. “Your support will enable us to bring the world of Takarazuka to life through beautiful sets and costumes. Scenic Designer Tesshi Nakagawa has designed an intricate and innovative set that transports the audience from the glitz and showmanship of the Takarazuka Revue, to the gritty behind-the-scenes of a working theatre. June Suepunpuck is designing costumes that capture the ornate and fanciful showmanship for which the Takarazuka Revue is renowned. For more information, go to https://www.indiegogo.com/projects/east-west-players-creates-the-world-of-takarazuka.